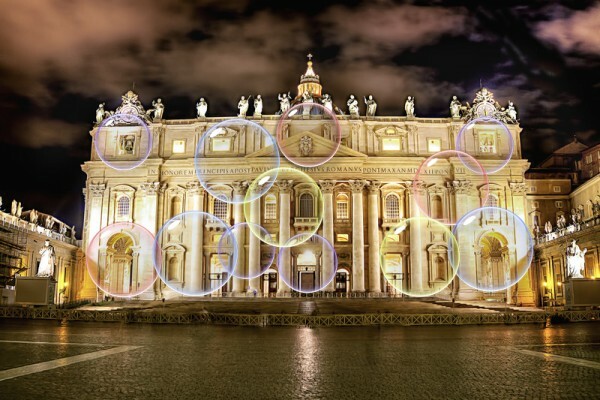 An illuminated projection of the Microsoft Office Bubbles theme onto the facade of St. Peter’s on Tuesday evening drew large crowds as the new basilica screen saver appeared, notifying the faithful that the basilica had not been in use for 10 minutes. The decision to use the new screensaver was made by Senior Vatican Security official Claudio Aquila who said that it was the Vatican’s duty to protect St. Peter’s from terrorists attempting to infiltrate the basilica. Critics say that the new measures are bothersome, especially since security officials are mandating that all employees of the Vatican change their password every first Friday of the month. At press time, Vatican officials are toying with changing the bubbles screensaver with that cool one with the bungalow on the water somewhere in Bali where you wish you were, but can’t because your job pays you crap.